Am really apologizing for the delay caused. Fever strikes me once again and forced me to take bed rest for a week and let's say fate, my brand new Redmi Note 3 Pro got some defects in its motherboard causing serious problem for app developments and testing, hence this long pause. So as a token of apology, I have released both NO Root and Root version of Toggle Mod v13.0 for Mini Militia v3.0.6. 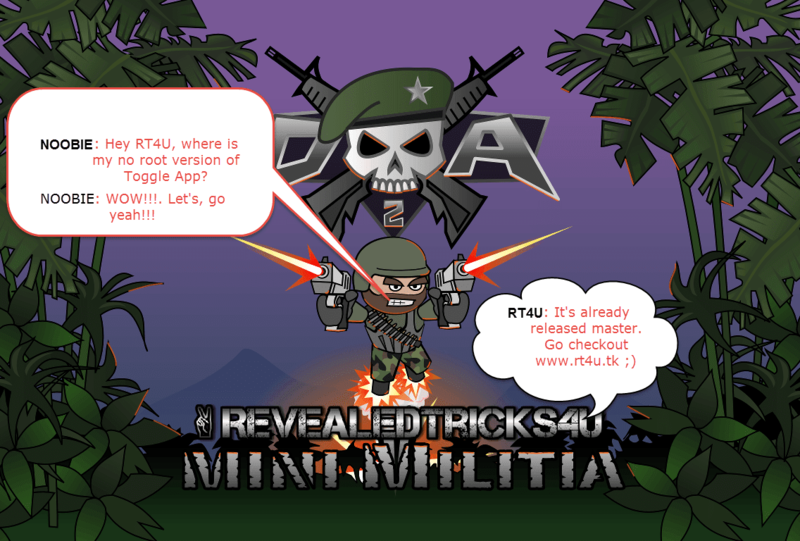 Includes all features from the latest version of Toggle Mod v13.0 - http://www.revealedtricks4u.com/2016/11/toggle-mod-v13.0-straight-update-mini-militia-v3.0.6.html , which is meant for rooted phones. Install the downloaded "MiniMilitiaMods-RevealedTricks4U.com-NOROOT-v13.0.apk" file. Make sure you have already installed the latest game "Mini Militia - Doodle Army 2". It is version 3.0.6, at the time of writing. Can I login with my google games account. When I select all the options on the patch screen, I can't kill anyone. Sometimes, almost all the time, the game server crashes and everyone except me, freezes. How do I fix this? Yeah!!! Love this!!! But plz fix unlimited ammo+dual wield , otherwise u totally rock!!! This version is best!!!! Hey ! Where is a Downloading link.